Example: Solve 3x+2y> 6 graphically. Solution: The dotted line is the graph of the given inequality. 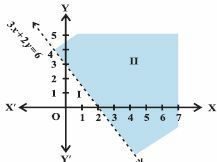 This dotted line divides the xy plane in two half planes I and II. We select a point say (0,0) which lies in one of the half planes. 3(0) + 2(0) > 6 which is false. The shaded half plane II excluding the points on the line is the solution region of the inequality. Q 1: Solve 3x-6>=0 graphically. Q 2: Solve 3x+y <= 12 graphically. Q 3: Solve x+y<5 graphically. Q 4: Solve x-y<=2 graphically. Q 5: Solve 2x+y >=6 graphically. Q 6: Solve y+8>=2x graphically. Q 7: Solve 3x-6>=0 graphically. Q 8: Solve y<2 graphically.